On May 25, 1921, Dublin was startled by the setting on fire by the I.R.A. of one of the finest buildings in the city, the Custom House. Men carrying petrol cans invaded the building in full daylight, placed the staff at work in the rooms under a guard, and deliberately fired the building at various points. For weeks the Custom House continued to smoulder, and in it were burned the documents connected with Inland Revenue and Customs, the Local Government Board and other public departments. About the same date, papers were discovered containing plans for incendiarism on the largest scale in England, including the destruction of all shipping in the Liverpool docks, and the entire electric plant of Manchester city—plans which were to have been carried out in a few days. Meanwhile the "Government of Ireland" Bill, which was to replace the Home Rule Bill passed before the War but never put into operation, had been fully discussed and was finally passed into law on December 23, 1920. In the circumstances under which it came into existence, it seemed to the majority of Irishmen a mere ruse de guerre, ineffectual and unreal. Yet, except in its recognition of partition, the Act had some good features. The two governments set up, one for the twenty-six Southern counties, the other for the six counties which called themselves Ulster, were given large powers, though with the reservation of some essential services. The provision for a Central Council seemed designed to open a path for future union, which the Bill looked forward to as the eventual wish of all Irishmen, both in the North and South. It did not aim at finality but at a future natural development of opinion. That this was the intention and wish of the British Government is made quite clear by the letter of Mr. Lloyd George to Sir James Craig, when the question was again under discussion. He says, on November 14, 1921, "all experience proves, that so complete a partition of Ireland as you propose must militate with increasing force against that ultimate unity which you yourself hope will one day be possible. . . . Your proposal would stereotype a frontier based neither upon natural features nor broad geographical considerations by giving it the character of an international boundary. Partition on these lines the majority of the Irish people will never accept, nor could we conscientiously attempt to enforce it. It would be fatal to that purpose of a lasting settlement on which these negotiations from the very outset have been steadily directed." And he proceeded to point out the disastrous effect which the creation of new frontiers "cutting the natural circuits of commercial activity" had had in Central and South-Eastern Europe; and the danger that, once established, they tend to harden into permanence. But to all such considerations Sir James Craig, as spokesman for the North, turned a deaf ear, flatly refusing to take any further part in the negotiations. In this resolve he is unlikely to change his mind. "If any person could be found in Ulster to lead the people into the Free State, it will not be by me," he is reported to have said in the Northern Parliament on April 4, 1922. The position of Ulster took a large place in the discussions on the Treaty in December of the following year (1921). It will be convenient to forestall a little and deal with them here. The Treaty presented to Northern Ireland a choice between two courses: either to remain in the Irish Free State, retaining all the powers and the whole area conferred on her by the Act of 1920, with her own Government and Parliament functioning and her individuality maintained, in which case there would be no need for a boundary revision; or to exclude herself from the Free State, in which case a revision of her boundary was to take place. Liberal safeguards were offered by the Free State in matters of religion and trade, and the full right was given to Ulster to negotiate on all questions effecting her under a unified system; in the words of Mr. Lloyd George in his final letter of December 5, 1921, she would enter the Free State retaining all her existing powers, with such additional guarantees as may be arranged at the Conference. But "Ulster" remained unmoved and hostile. It is fair to the North of Ireland to remember that when these proposals were made, the South was in the throes of an internal strife which had convulsed the whole country; the newly created Free State might make the most favourable proposals and be perfectly sincere in its intention to carry them out, but it was far from certain that its leaders would be in a position to do so. The chances that the Free State itself might be unable to function, and that a Republican party might grasp the reins of office, were by no means a remote possibility, and the events that immediately followed the signing of the Treaty in Ireland were not of a kind to induce a change of opinion. A new civil war plunged Ireland again into chaos, and the Free State came into existence under circumstances the most disadvantageous that could be imagined. She had to fight for her existence and for recognition even among her own people. Ulster claimed that by the Act of 1920, the six Northern counties, which would give her a definite Unionist majority, and which alone she felt in a position to claim, were definitely and finally committed to her government. On this her Government took and has always taken its stand. In Clause 1 (sub-section 2) of the Government of Ireland Act, it is laid down that "Northern Ireland shall consist of the Parliamentary counties of Antrim, Armagh, Down, Fermanagh, Londonderry and Tyrone, and the parliamentary boroughs of Belfast and Londonderry. This seemed explicit, but the Free State contended that a new aspect had been given to the matter by Art. 12 of the Treaty which provided for the appointment of a Commission of three representatives for the Free State, the Governments of Northern Ireland and of Great Britain respectively, "to determine in accordance with the wishes of the inhabitants, so far as may be compatible with economic and geographic conditions, the boundaries between Northern Ireland and the rest of Ireland." It might be upheld that the original distribution of territory is safeguarded by the preceding clause, which declares that the provisions of the Act of 1920 "shall, so far as they relate to Northern Ireland, continue of full force and effect" but this clause came to be disregarded and a claim was made for the restitution of two of the largest counties, Fermanagh and Tyrone, to the Free State, on the ground that they had Nationalist majorities. The problem of majorities in the North is very complicated; in the whole province the Unionist majority was at the time probably about 14 to 11; but the divisions are by no means evenly distributed. In the two disputed counties the Nationalist majority is small, possibly about 15,000 out of a population of 142,665; in Fermanagh, about 7,000 out of a population of 61,836, as given in the Census of 1911. But there have been considerable fluctuations of population since that date and the Nationalist majority has probably decreased. Sir James Craig asserted that he had received a definite promise from the British Government that the six counties were "a clean cut" and final settlement, and that he had never been a partner to any later modification of the agreement. The Free State declared that this agreement did not affect the new d vision demanded by Southern Ireland on the lines of Article 12 of the Treaty. The phrasing of Article 12 is undoubtedly vague, perhaps purposely so, and there has been much difference of opinion as to what was intended by it; whether, that is, it referred merely to slight adjustments of the frontier or to the transference of large districts. One of the most important statements on the subject was made by Lord Long, on the eve of his death, in which he stated that on one condition, and one alone, could a plan be arranged with the Northern leaders, "and that was, they should receive a definite pledge from me, on behalf of the Cabinet, to the effect that, if they agreed to accept the Bill (of 1920) and to try to work it when passed, it would be on the clear understanding that the six counties, as settled after the negotiations, should be theirs for good and all, and there should be no interference with the boundaries or anything else, except such slight adjustments as might be necessary to get rid of projecting bits, etc." Lord (then Mr. Walter) Long was in charge of the Bill in the House of Commons. The statement is therefore authoritative. The matter having been brought by him before the Cabinet, they unanimously agreed to give the definite promise to Carson and Craig, who then reluctantly agreed to accept the Bill. It was not welcomed by any Party. "The Liberals boycotted it ... the Conservative party took no interest in it . . . the Ulster people stood coldly aloof." Sinn Fein took no notice of it. The Boundary Commission met in the year 1925. Ulster refused to send a representative on the ground that no change in the boundaries could be contemplated. Judge Feetham, appointed by the British Government, presided, and Professor Eoin MacNeill represented the Free State. The chairman took the view that only minor adjustments could come under consideration, and Mr. MacNeill resigned. In consultation in London in December it was agreed to ignore the whole boundary provisions of the Treaty, and leave the original boundaries unaltered; but in return the Free State was released from her agreed obligations to share the National Debt. Belfast has a large stake in the country, and her relations with the Free State are a factor of importance in her trade. In 1919 Belfast exported ships to the value of £10,000,000, linen yarn and goods to the value of £35,000,000, machinery valued at £2,000,000 and manufactured tobacco to the value of £2,000,000 apart from excise duty. In that year the total value of Irish exports was £176,000,000, and the total value of her imports was £159,000,000. In 1920 the figures rose to £61,000,000 for Belfast imported goods, out of a total of £204,000,000 for the whole country. The export trade has also increased. Of this trade, a fair proportion, some £30,000,000 in 1919, and some £40,000,000 in 1920, is with the Free State. Since that date, the state of the country and the general commercial depression have adversely affected trade, not only with the south but with Britain and with foreign countries. When the commercial interests of the two States are considered, and the volume of trade that depends on their close proximity, the paramount importance of friendly relations between them becomes evident. Large numbers of persons in the North are depending directly on the industries and trade taken by the Free State. The present situation is costly as well as unsatisfactory. These practical considerations re-enforce the more abstract ones of love of country and fellow-feeling among its people as a whole. Only the growth of mutual confidence and respect between North and South can bring about the much to be desired re-union between the two sections of the Irish people, at present dis-united. But with the growing sense that the Free State has settled down to govern, and intends to govern on practical and tolerant lines confidence will, we may hope, be restored and the more comprehensive handling of national problems take the place of local interests. 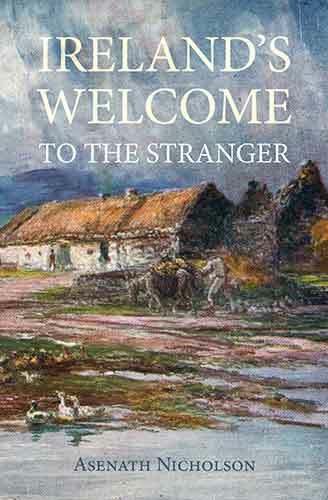 The inhabitants of the North as well as of the South are proud of the name of Irishman, and we believe there is a larger proportion of Ulstermen who would welcome re-union than is commonly supposed. Ulster was the cradle of Irish romance, the dwelling-place of Cuchulain, greatest of heroes, and of the champions of the Red Branch; of Deirdre of the sorrows, and Emer, and Fand; the cradle, too, of Irish Christianity, it boasts the primacy of Patrick and the birthplace of Columcille. Later, it gave some of the most famous names to Irish history, such as Shane and Hugh and Owen Roe O'Neill, Hugh Roe and Rory O'Donnell. With such names, household words among their countrymen the world over, it is not surprising that a break between the North and the South seems unthinkable. But only mutual confidence can unite the disjointed provinces. A speech of Mr. Blythe, Minister for Finance in the present Dail, though couched in homely language, expresses a truth that the North will understand. "The way to remove this division is not to bother with the people who are outside the State, not to find fault with them or revile them, but to get on with our own tasks." If this had been the policy of the last ten years, there might have been no trouble about the boundary question. But the murder and boycott of Catholics in the North, and the official boycott of Ulster by the South have both left bitter memories, and broken down all hopes of union for this generation. Both crimes made partition actual in thought and inevitable in policy.